The game does not correctly select my deputy captain when I substitute my first choice captain during a match. I have selected Harry Kane as my captain. 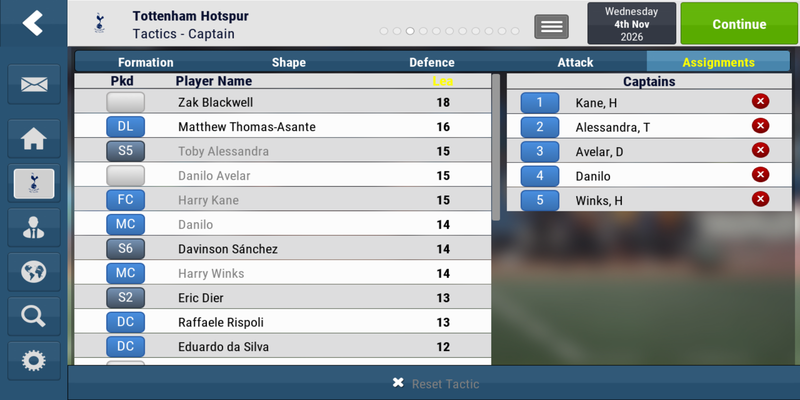 In the tactics assignment screen, I have selected a number of players to take over that responsibility when Kane is substituted. However, despite my deputies being present in the match team, the captain's armband is handed to a player (Martin Laxalt) who isn't on this list and has a terrible leadership rating of 9. As you can see on the match summary screens, Laxalt has been designated the captain. And here is my captain assignment list. HI Dean, No save needed I managed to reproduce this on my end. This is now logged with our development team.